Last week I was training in a gym and got continually frustrated with the whole environment and the gym goers lack of understanding of how to train. It is not the lack of understanding that frustrates me, but the persistence to continue to ‘wreck’ your own body in the pursuit of a ‘better’ body without seeking advice. Of course it is my job and the job of my fellow personal trainers to give you that understanding, however we can not do that without you first seeking advice. We can of course come up to you in the gym and inform you at the time, but there is only so much of that you can do as a personal trainer before people get annoyed with you. I could go on. Instead of seeking advice after these findings why don’t people search for help from a professional to prehab themselves, to build a good, strong foundation and to become more efficient in the gym? Gym culture prescribes regimes of sit-ups (classic one being a sit up on the weights bench with your feet hooked under the foot cradle), crunches and double leg lifts or worse still double leg lifts with a partner chucking your legs down. These are the sort of exercises that are going to cause you back pain. They over work your upper abdominals and hip flexors and under work your lower abdominals and pubococcygeus (PC) muscle of the pelvic floor. It can also cause scary shearing strains across the high lumbar segments. 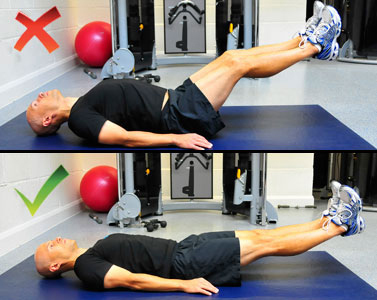 Double leg lifts are ok if done correctly. That means using your lower abdominal muscles to press the low back firmly to the floor so there is no excessive force on the lumbar section of the spine as people tend to hyper extend their lower back and use the hip flexors to get the legs up. Focus your abdominal exercises on spine stabilisation exercises to build that strong foundation and postural support : 4 point vacuums, Birddogs, Dead bugs, Plank and side plank variations. In exercises such as Deadlifts and front squats spinal stabilisation become very important when lifting heavy. I see too many people trying to lift heavy to try to impress the non-existent judge in the weights room. By doing so their form is dangerous and they are misfiring muscular activation, such as the Glutes. You will get a much better workout from working in good form lifting a lighter weight then you will from trying to lift as heavy as possible and substituting form. Deadlifts are a hip hinge exercises and spinal stabilisation is a must. The muscles being worked during your deadlift workout should be predominantly your Glute Max and you abdominals, with some help from your hamstrings. Your back will assist in spinal stabilisation but in no means should you feel it excessively here. If you wake up and your Glutes and abs are on fire then you know you have lifted well, if you wake up and your low back is on fire, you have sacrificed form for weight. People think that if you want to work on balance you need to do it on an unstable surface. Ask yourself a question – are you stable on an even surface currently? If your answer is no, then you need to get stable on an even surface first – BOSU’s and wobble boards/cushions etc will be a progression for you later on. Try stabilising on one leg, sitting into a quarter squat position for 30 seconds. How hard is it for you to keep your knee and ankle still with your posture maintained? The other thing people do on Fitballs and BOSUs is try and perform a real complicated exercise with weights and all sorts – again compromising form for ‘funky innovative’ points. Or performing sit ups on them with poor form so that the ball is rolling back and forth, they are thrusting and using momentum rather than muscular contraction and because of this feel the need to make it harder so go and grab a weight to hold. They then continue to thrust there the weight forwards to get them up into the sit up. If any of this sounds familiar to you, re think what you are doing in the gym and seek advice. PLEASE. IT IS YOUR BODY AND THE ONLY BODY YOU HAVE – LOOK AFTER IT – LEARN HOW TO IMPROVE YOUR BODY. Learn how to exercise efficiently. Learn to become more body aware. Learn how to engage and activate the muscles needed to perform the action you are telling it to do. For example engage the Glutes in a deadlift by driving the needs out against your arms just before you lift, draw you abs in under your rib cage as you perform your ab exercises, press your hands through the floor to engage your pecs in your press ups. Build a strong foundation to work off. DO NOT sacrifice form for larger weights. No Comments to "GET HELP"